To see full gallery of Topper Industrial Specialty Delivery Carts, Click HERE. 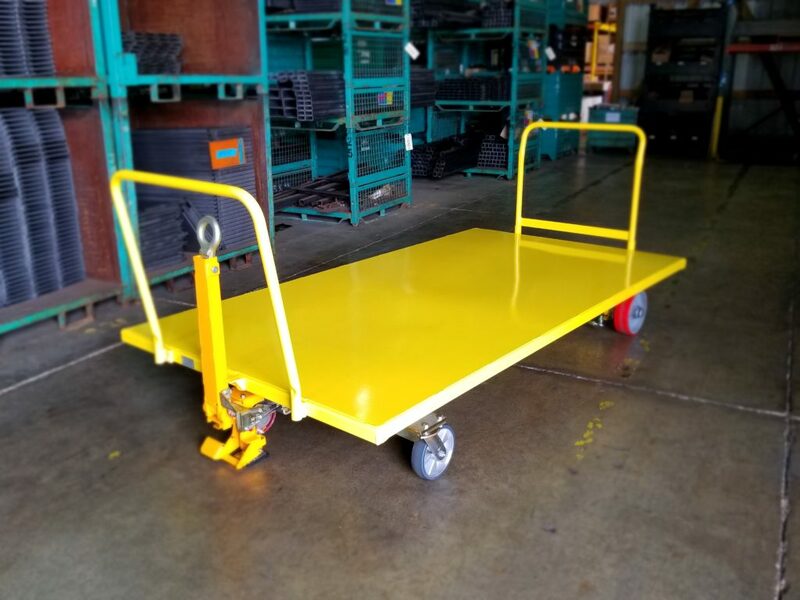 The highlighter specialty cart is design and built by Topper Industrial. Topper Industrial is well known for being a leading material handling cart manufacturer. Topper is also recognized as pioneer in the fork truck free movement in North America. The pictured cart is a Transformer Quad Steer Cart. Its dimensions are 56″ x 102.” The Cart is used to deliver product line side. It operates as a but quad steering cart when in tow mode to give optimal tracking. It transforms from a tugged cart to a caster steer when being pushed by hand for operator ease. The wheels on the transformer quad steering cart are 8” RS Polyurethane Swivel Casters on front and the rear has 10×3 Polyurethane Wheels.